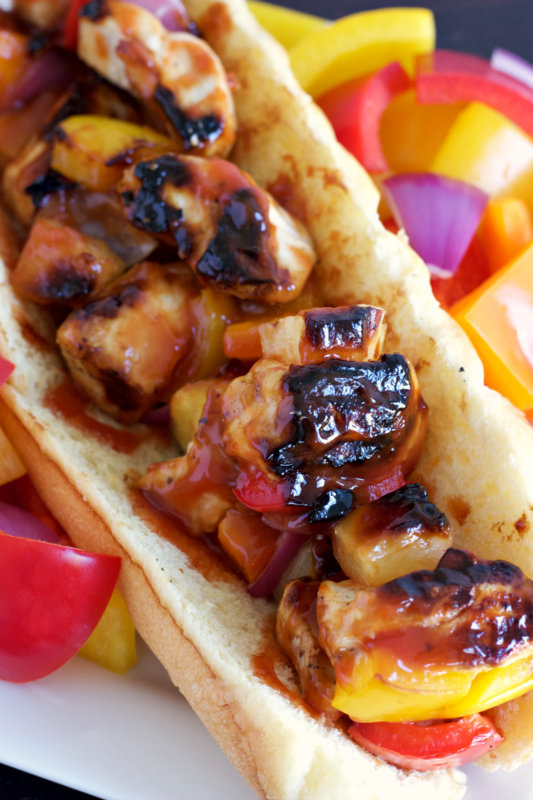 These deliciously grilled chicken kabobs are slathered with a savory pineapple BBQ sauce and served on a toasted hoagie roll. I’m a bit of a BBQ sauce snob. There are only a couple of store-bought sauces that I will even allow near my food. In fact, when we dine out I try to avoid meals with BBQ sauce because most are not up to par. So when my husband decided to whip up a BBQ sauce infused with pineapple juice, I was a bit skeptical. I love pineapples, but BBQ sauce AND pineapple juice? I wasn’t quite sold on the idea. A handful of ingredients later and I wanted to marinate all things with this BBQ sauce. Seriously y’all, it’s THAT good. But instead of going BBQ sauce crazy, we decided to put it to good use and grill some chicken kabobs. Because nothing emits summer like grilled grub. Never mind that it’s still freezing here and a snowstorm is approaching. So if you’re in the mood for some grilled goods but can’t crank the outdoor grill just yet, opt for a Cast Iron Griddle Grill Pan (affiliate link). Best invention since sliced bread. 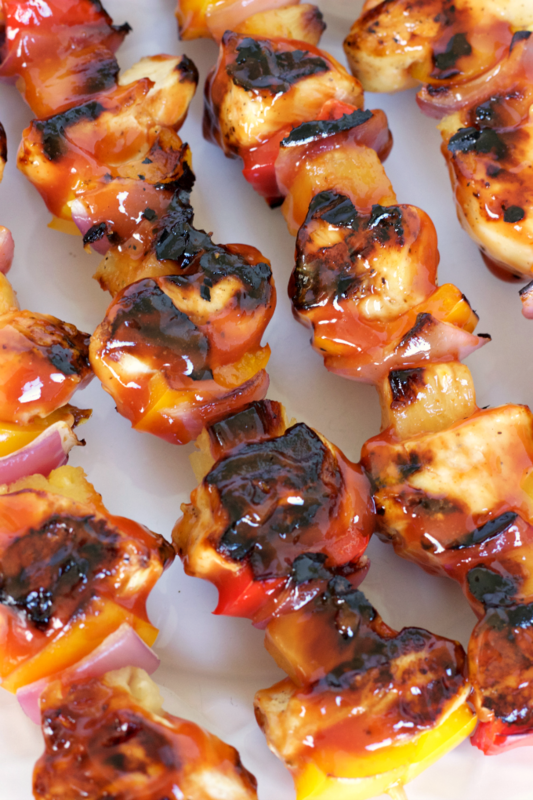 These chicken kabobs are savory with a hint of sweet citrus flavor from the pineapple chunks. The perfect flavor combination that takes me back to my island days. And because we like to be a bit extra around here, we toasted hoagies rolls and filled them with the grilled chicken kabobs and slathered some more BBQ sauce. Seriously, make them and then let me know what you think. 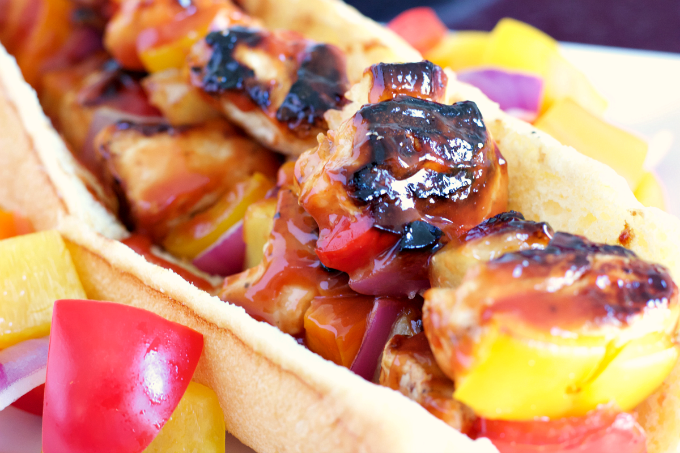 Do you enjoy grilled chicken kabobs? What are some of your favorite flavor and ingredient combinations? I’d love to hear from you! Whisk together ketchup, pineapple juice, brown sugar, Worcestershire sauce and ground mustard in a bowl. Thread chicken, peppers, red onion and pineapple chunks alternately onto skewers. 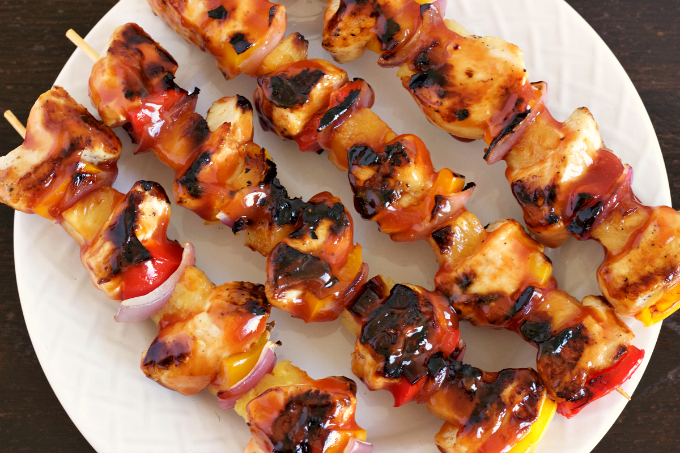 Brush with BBQ sauce on each side and grill chicken kabobs until slightly charred. 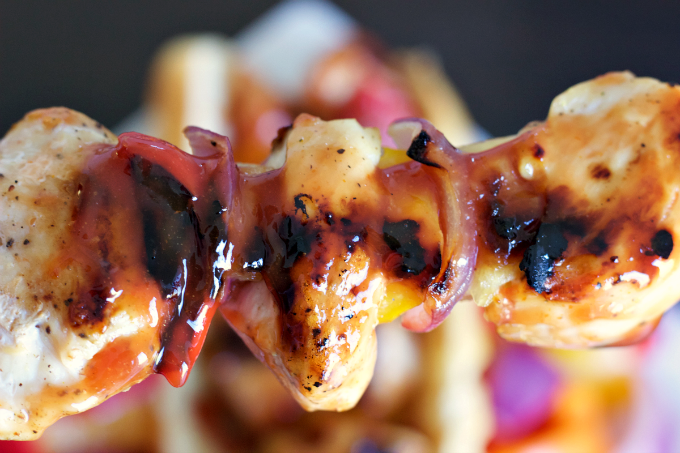 Remove kabobs from grill and brush with additional BBQ sauce. Serve kabobs as is or serve with a side of rice or on a toasted hoagie bread. « Easy and Delicious Asian Foods plus a Giveaway!